Location: Santa Ana Foothills east of Orange. From the 55 freeway, take the Chapman Avenue exit and head east for 4.2 miles until you get to Jamboree Road. Take a left on Jamboree and a right into the park. From the north, take the Katella Avenue exit from the 55 freeway, head east and drive 4.6 miles to Jamboree and take a left (Katella becomes Villa Park and then Santiago Canyon Road on the way). Parking is $3 per car on weekdays, $5 on weekends and $7 on holidays. For access to this hike, park in lot #7. 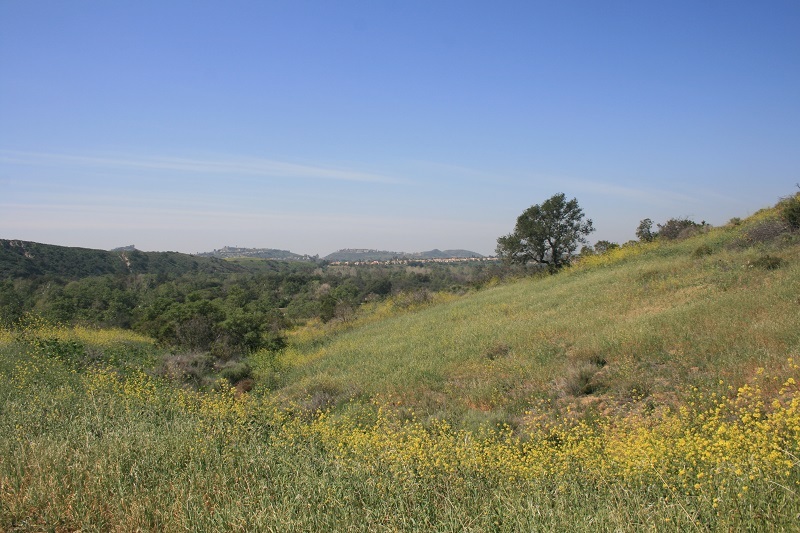 In addition to being Orange County’s oldest public park (1887), Irvine Regional Park is home to the O.C. Zoo, a miniature railroad, several nice picnic areas and for the purposes of this website, a number of hiking trails. 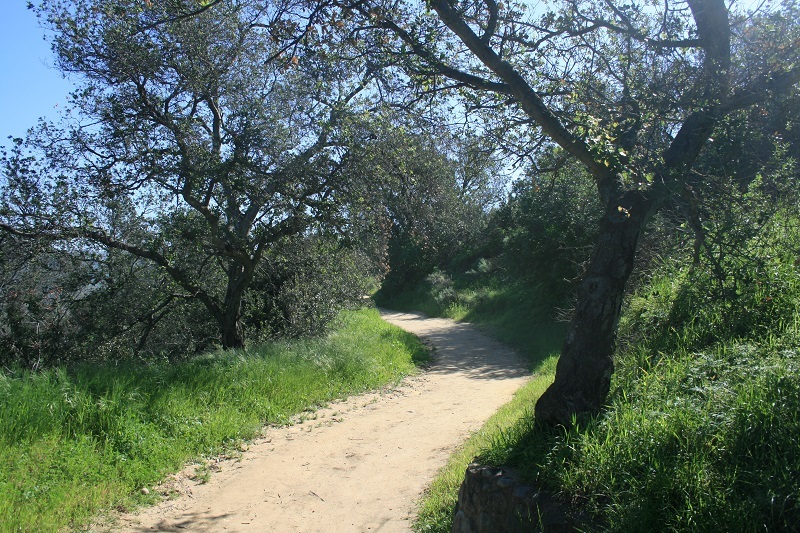 The trails loop around the park, heading northwest to Santiago Oaks Regional Park and south to Peters Canyon Regional Park, making for endless possible routes of all lengths. 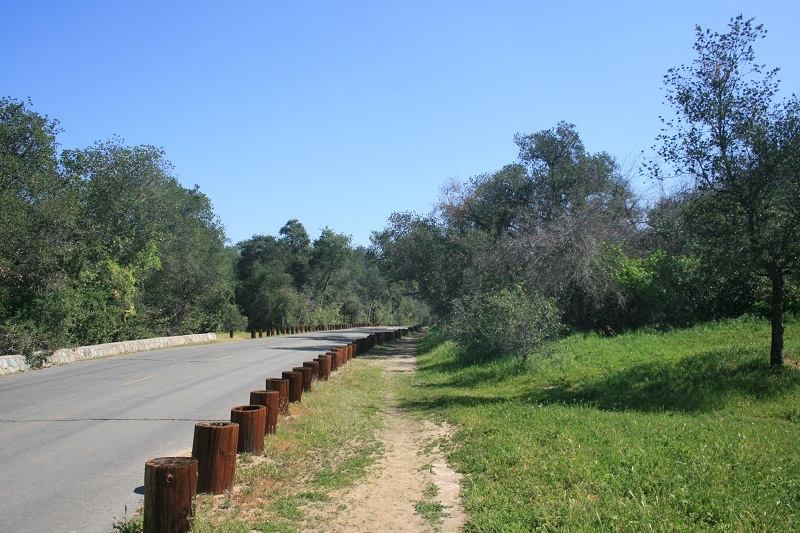 While Irvine isn’t as isolated as Caspers, Whiting Ranch and some of Orange County’s other regional parks, it still offers a nice variety of scenery, a convenient escape from city life. Though it may be hot during the summer, the hills and distances are moderate enough for it to be considered a year-round hiking destination. 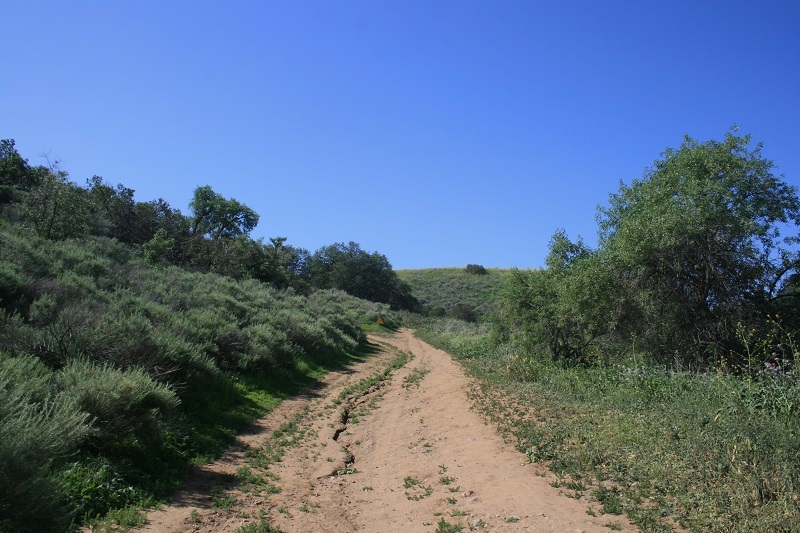 This post follows the route as described in “Afoot and Afield”, mainly utilizing the park’s popular Horseshoe Loop Trail; also the Toyon Trail and some paved service and access roads. Hikers on a tight time frame should be able to easily knock it off in an hour; those hiking with small kids or dogs (this is one of the few dog-friendly regional parks in O.C.) should allow an hour an a half to follow this route. 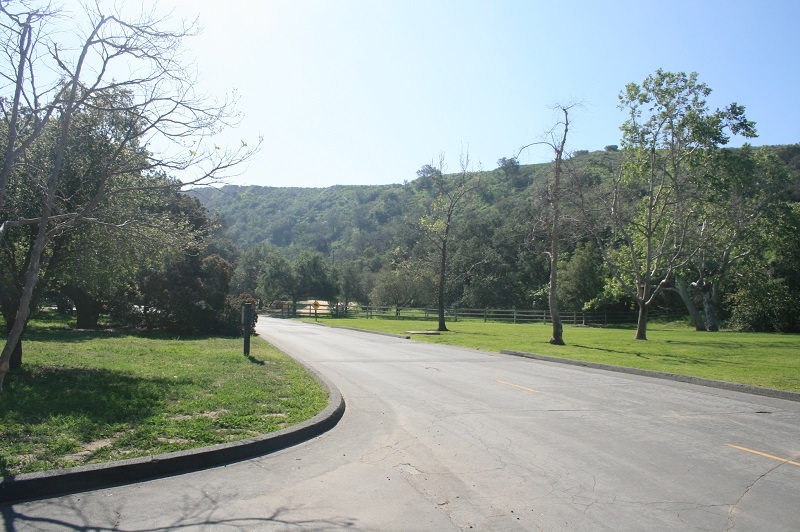 From lot #7, head left on the paved road and pick up the trail on the right, heading uphill between two wooden fences. You soon reach a junction with the Horseshoe Loop Trail where you’ll turn left and then almost immediately left again as the Puma Ridge Trail heads uphill. 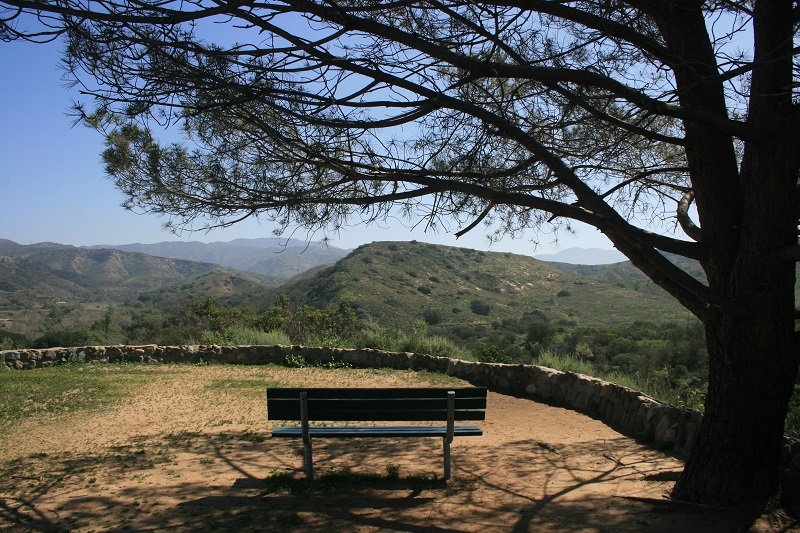 Follow the Horseshoe Trail along a north-facing ridge, enjoying views of the Santa Ana Mountains. In the spring, the grass and wildflowers can be quite attractive and considering that you are only about one hundred feet above the basin of the park, the views are quite wide-ranging. More climbing brings you to a vista point (0.8 miles) where you can sit on a bench beneath a pine or under a shade structure. From here, the trail descends to cross a private service road (1.1 miles) and soon after joins the main road, which it parallels for 0.2 miles to the last parking lot. The road, still paved but now closed to the public, heads north and then west, skirting the park’s boundary. At 1.8 miles, the northern branch of the Horseshoe Trail splits off to the right, heading uphill. Take a short detour to Rooster Rock, a sandstone formation likely named for its outcrops that resemble poultry beaks and combs. 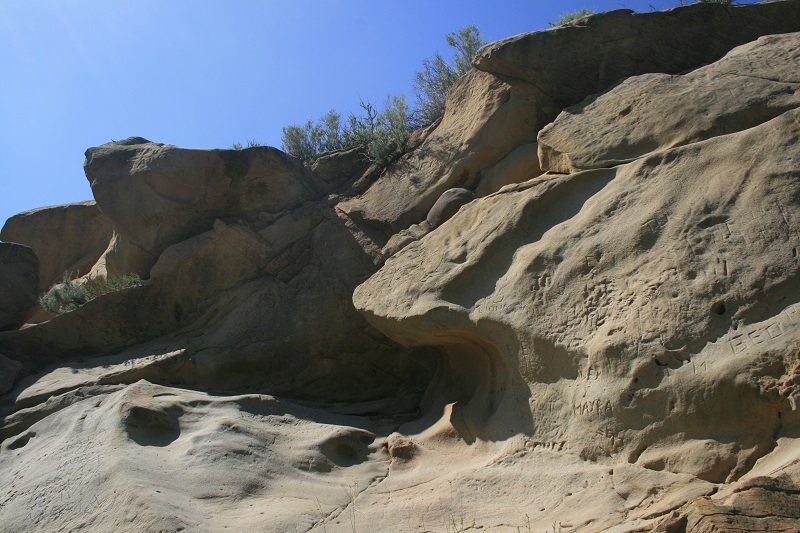 A pair of oaks provide nice shade beneath the rock while a few use trails allow the curious to explore the top of the formation, which offers a bird’s eye view of this area of the park. After visiting Rooster Rock, head back and follow the Horseshoe Trail as it makes its way up a hillside to a junction. The two paths soon merge again, although the right fork climbs higher and offers better views. From here, the trail levels out, contouring along the north side of the park to a junction at 2.3 miles. 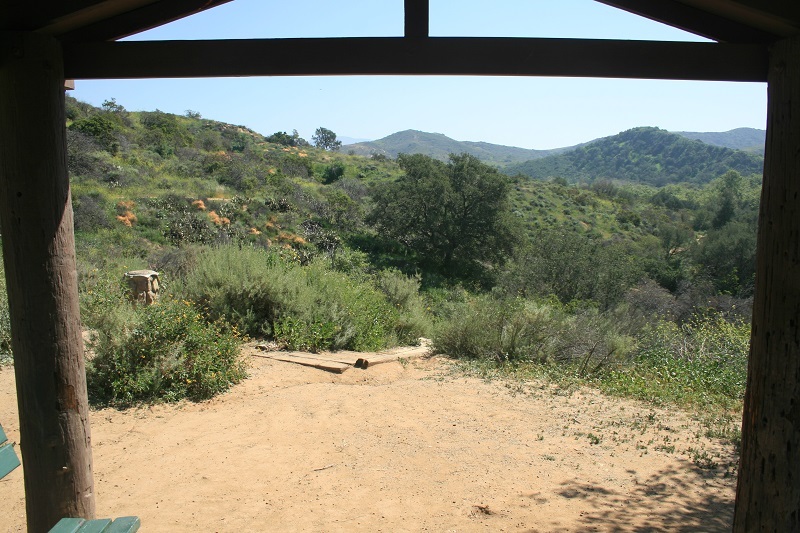 This is the Toyon Trail, which descends to a shade structure and then follows a wooden staircase back down to the center of the park. Head right on the paved road and follow as it passes a picnic area, the railroad tracks and a small lake before ending at a T-junction. Turn right and follow the main road back to the parking area.